DITMARS — The owners behind a trio of popular bagel and coffee shops in Astoria have new plans percolating. Peter Voyiatzis and John Rocchio, the business partners behind Brooklyn Bagel & Coffee Company — which has three locations in Astoria and another in Chelsea — are opening a coffee and tea house called 60 Beans. 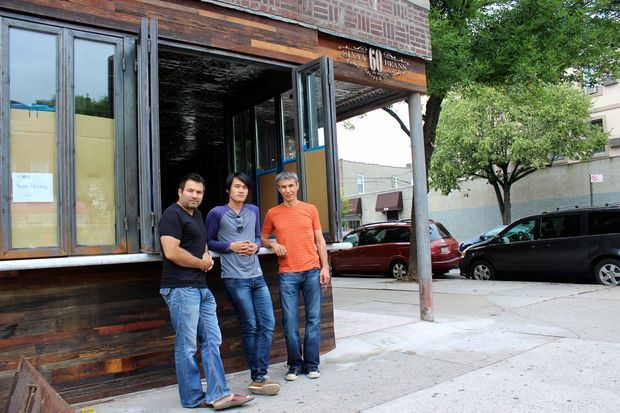 The new cafe is located on Ditmars Boulevard and 36th Street and is expected to open early next month, according to the owners, who said the name is inspired by Beethoven's coffee habits, as the composer was known to drink java made with precisely 60 beans per cup. "He was obsessed with his music, but he was also obsessed with his coffee," Rocchio explained. "We share the same obsession," Voyiatzis quipped. The pair said they decided to branch out from their bagel stores — the first of which opened in Astoria more than a decade ago, and whose bagels were recently deemed the best in New York by BuzzFeed — because of their love for coffee. According to manager Paolo Maliksi, the new cafe will serve high-quality brewed coffee and espresso drinks, both hot and cold, as well as a selection of teas. Their beans will hail from George Howell Coffee, a well-known roaster based outside of Boston that provides single farm-sourced coffees. They also plan to serve wine and craft beer in the evenings, as well as a simple menu of pastries and other food items that will compliment the coffee and tea offerings. The space will have free WiFi, outdoor seating along 36th Street as well as a stand-up counter along the front of the restaurant on Ditmars Boulevard with windows that open into the shop. 60 Beans is expected to open the first week of August.